Picture Collage Maker Pro Worth $69.90 is undergoing FREE Giveaway for unlimited time. Its a limited Number Giveaway only for the first 20 Requests. This giveaway of Picture Collage Maker Pro is 100% full functional, clean and free and co-sponsored by TheCustomizeWindows and PearlMountain Technology Co., Ltd.
With 100+ various templates provided to make digital photo collages, scrapbook, greeting cards, posters, calendar, photo album for any occasion, like Birthday, Easter, Christmas, Thanksgiving, Wedding, etc. Picture Collage Maker Pro Support drag and drop photos onto collage. It comes with a large collection of beautiful picture frames and masks that you can add to any of your photos. Personalize your creation by adding clip-art, text, background. It allows you to resize, rotate and position all the elements to make collage crafting intuitive and fun. Save collage as an image file, set as desktop wallpaper, share through Email, or print it out instantly to share with friends and family with Picture Collage Maker Pro. Duration: Picture Collage Maker Pro From Pearl Mountain is free to first 20 applicants from today. Promotion will not limited by time. 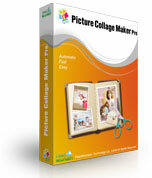 Picture Collage Maker Pro Giveaway Offer is Open ! You can download Picture Collage Maker Pro by clicking here. Install it and Before that, Request us for the Key for Picture Collage Maker Pro through Comments. This Article Has Been Shared 2287 Times! Premium Image Converter Software worth $29.90 is undergoing FREE Giveaway for 20 days only on The Customize Windows. Its a limited Giveaway only to first 15.
thanks for the apps,what is the key? thanks for the apps,what is the key for picture collage maker? You are welcome. We have sent the email to the developer. We / the developer will let you know via email. could i have my key number for picture collage maker pro please? Will we send you the email on that email address you have used in this comment form ? Oho..forgot to ask you, which you want – Windows version or Mac version ? Cite this article as: Abhishek Ghosh, "Picture Collage Maker Pro Worth $69.90 Giveaway from TheCustomizeWindows," in The Customize Windows, May 25, 2012, April 19, 2019, https://thecustomizewindows.com/2012/05/picture-collage-maker-pro-worth-69-90-giveaway-from-thecustomizewindows/.